​The Little Dragons Program makes it fun and exciting to accomplish these skills. The lessons are disguised in games and exercises making it fun to learn. This program was developed specifically for children 3 through 6 years of age. This class offers a strong foundation in karate skills along with essential character building qualities such as courtesy, respect and discipline. In addition, the program is designed to improve children's motor skills and enhance their ability to pay attention and follow directions. All classes are taught using the safest, fun, and exciting instructional methods available for this age group. 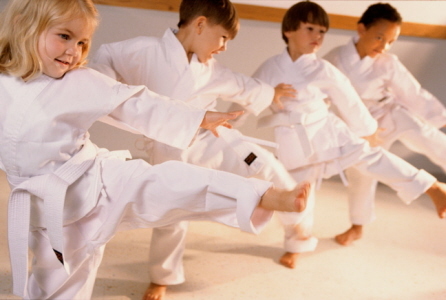 In our Little Dragons class students will learn basic self defense skills to protect themselves physically. Coordination drills are used to improve balance and increase strength. Little Dragons will learn stranger awareness and kidnapping prevention techniques to teach them what to do if confronted. We emphasize that our karate skills are only to be used to defend our lives and protect our bodies. 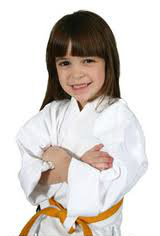 It is very important to us that the children learn the difference of when to use their karate skills and when to walk away or involve an authority figure. To help them understand we have developed the "Ten Karate Promises". These promises are recited in each class, and an understanding of the meaning is required of the student before passing to the next rank. 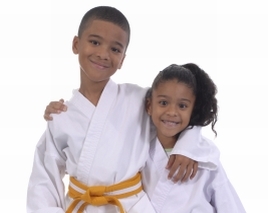 Parents are encouraged to discuss any issues regarding this with the instructors, so that we may work together to achieve black belt excellence in each student. 1. I promise to use my karate for self defense only. 2. I promise not to use my karate on family , friends or pets. 3. I promise to use good manners always. 4. I promise to treat other students with respect. 5. I promise to always try my best at everything I do. 6. I promise to obey my parents always. 7. 7. I promise to use my words to show my feelings. 8. I promise not to kick or hit to show my anger. 9. I promise to keep my mind and body healthy. 10. I promise to be a good kid and a great karate student always.